Evangelos Venizelos (Greek: Ευάγγελος Βενιζέλος, pronounced [eˈvaɲɟelos veniˈzelos]; born 1 January 1957) is a Greek politician who was Deputy Prime Minister of Greece and Minister for Foreign Affairs from 25 June 2013 to 27 January 2015. Previously, he was Deputy Prime Minister and Minister for Finance of Greece from 17 June 2011 to 21 March 2012. He is a member of the Hellenic Parliament for the Panhellenic Socialist Movement (PASOK) for the first electoral district of Thessaloniki. 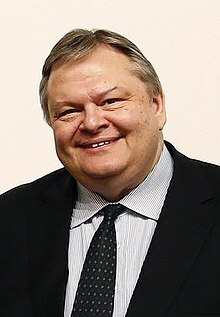 On 18 March 2012, Venizelos was elected unopposed to replace George Papandreou as PASOK president and led the party in the May 2012 general election as well as the June 2012 general election. Evangelos Venizelos was born in Thessaloniki on 1 January 1957. He is unrelated to his famous namesake, Eleftherios Venizelos.. He is married to Lila A. Bakatselou and has a daughter. He was an undergraduate at the Aristotle University of Thessaloniki from 1974 through 1978 and completed postgraduate studies at Panthéon-Assas University in France. In 1980, he received his Ph.D. in Law from the Aristotle University of Thessaloniki. Venizelos is the author of a number of books, monographs and papers, including most recently Agenda 16 (Greek: Ατζέντα 16) in 2007, a collection of writings about the future of the university system in Greece, including some articles previously published on the web. Other writings have dealt with current political issues and the media, foreign policy, and developmental policy. His recent works focus more on political theory and cultural issues. He strongly opposes the clash of civilizations theory, and has written extensively about the Greek "civilization of civilizations" (Venizelos, 2001). As a student, Venizelos served on the Central Council of the Student Union of the University of Thessaloniki (FEAPT) in 1977, and the National Student Union of Greece (EFEE) in 1975. Venizelos was elected as a PASOK MP in the Thessaloniki A constituency in the general elections of 1993, 1996, 2000, 2004, 2007 and 2009. He has been a member of the parliamentary committee for the Revision of the Constitution, on which he was spokesman for the majority party in the parliaments elected in 1993, 1996, 2000, 2004 and 2007. He was also a member of the Standing Committees on National Defence and Foreign Affairs, on Public Administration, Public Order and Justice and on European Affairs. In parliament, Venizelos currently serves on the Special Permanent Committee on Institutions and Transparency and on the Special Permanent Committee on monitoring the decisions of the European Court of Human Rights. In addition to his role in parliament, Venizelos has been serving as member of the Greek delegation to the Parliamentary Assembly of the Council of Europe since 2016. A member of the Socialists, Democrats and Greens Group, he serves on the Committee on Legal Affairs and Human Rights; its Sub-Committee on the implementation of judgments of the European Court of Human Rights; the Committee on Rules of Procedure, Immunities and Institutional Affairs; and Committee on the Election of Judges to the European Court of Human Rights. He has been a member of the PASOK Central Committee since 1990. In the past he was a member of the PASOK Executive Bureau. Deputy Prime Minister and Minister for Foreign Affairs, from 25 June 2013 to 27 January 2015. After the legislative elections of 2007, in which PASOK was soundly defeated, Venizelos announced his candidacy for the leadership of the party. In the leadership election, held on 11 November 2007, Venizelos was defeated by incumbent party leader George Papandreou, receiving 38.18% of the vote against 55.91% for Papandreou. When named by Papandreou to the finance and deputy PM positions in June 2011, Venizelos said "'I am leaving defense today to go to the real battle' to reduce Europe’s biggest debt load – almost 1 1/2 times the size of its economy." David Marsh of London and Oxford Capital Markets in MarketWatch wrote that both "German parliamentarians who voted solidly earlier this month to involve private-sector creditors in the next bail-out package", which Angela Merkel has now dropped as a precondition, and "Greece’s politicians and people, who must bow to further austerity as the price for fresh external support", were central as "the stage now shifts to further players in the theatre of Greek affairs." And "[n]obody knows whether the burly new Finance Minister Evangelos Venizelos will put in a starring role or turn out merely as a transitory figure." Venizelos was active in the Macedonia naming dispute, when elements in Greece opposed the use of the name "Macedonia" by the newly independent neighbouring Republic of Macedonia. Columnist Mark Dragoumis of Athens News opined that, "[i]n February 1994, as minister of information, [Venizelos] was instrumental in convincing the ailing Prime Minister Andreas Papandreou to impose that idiotic 'embargo' on the country later named FYROM." Dragoumis maintained that Venizelos' motivation was to gain "nationalist votes in his Thessaloniki constituency". Dragoumis also criticised Venizelos for helping pass a law – "in order to boost [his] popularity among Greek republicans" – to impose a requirement on King Constantine II, former king of the Hellenes, and his family if they wanted to be granted Greek nationality. The requirement was to submit a declaration that they "unreservedly respected the 1975 Constitution and accepted and recognised the Hellenic Republic". The columnist termed it a "silly precondition – reminiscent of the 'declarations of repentance' that Greek leftists were obliged to sign under pressure during the civil war and after". Ultimately, the law proved irrelevant once Greece signed the Schengen Agreement allowing the ex-king to travel to Greece via Italy without having to pass through Greek immigration. ^ Ανακοινώθηκε το νέο υπουργικό σχήμα. ANA-MPA (in Greek). ana-mpa.gr. 17 June 2011. Retrieved 17 June 2011. ^ "Greek socialists vote for finance minister as new leader". Kathimerini. Athens. 18 March 2012. Retrieved 18 March 2012. ^ Mark Dragoumis (12 January 2007). "Education is not possible in universities at the mercy of 'rebeloi'". Athens News. Archived from the original on 12 October 2007. Retrieved 29 September 2007. ^ Mark Dragoumis (5 October 2007). "Pasok's lost cause: 'Always oppose - never propose'". Athens News. Archived from the original on 11 October 2007. Retrieved 11 October 2007. ^ πολιτικό ημερολόγιο...: Λάσπη στη Wikipedia: Η μάχη των ονομάτων! ^ "George Papandreou wins PASOK leadership election with 55.91 pc", Athens News Agency, 15 November 2007. ^ Petrakis, Maria, and Natalie Weeks, "Greek New Finance Minister Venizelos Says Prepared for Battle", Businessweek, 17 June 2011, 11:29 AM EDT. Retrieved 21 June 2011. ^ Marsh, David, "For Greece, a delicate endgame of fingerpointing ", MarketWatch, 20 June 2011 12:01 a.m. EDT. Retrieved 21 June 2011. ^ a b Dragoumis, Mark (5 October 2007). "Pasok's lost cause: 'Always oppose – never propose'". Athens News. Archived from the original on 3 April 2012. Retrieved 21 June 2011. .
^ "The ex-king Konstantine de-Grecia departed from Greece (in Greek)". typos.com.cy. 16 February 2003. Retrieved 26 November 2012. .